A rut of rich, cheesy, decadent things is not a bad rut to be in, but it’s a rut nonetheless. A food blogging rut that led me to peruse an old favorite, Food Network (.com), in search of fresh recipe ideas. Before I became a late bloomer attendee to the food blog party/the internet, Food Network was one of my few go-to sources online for what I should make for dinner…tonight. I was in the throes of long hours as a tax accountant, and I didn’t get home until 7 or 8 (on a good night); basically I was the reader who I’m now trying to help: a food lover with limited time to cook. I could always count on the site (and the shows) to keep me posted on the latest home cooking trends, which is exactly what I found this time, in the form of Giada’s quick chicken piccata. Apparently one thousand three hundred fifty-nine people love it. Crazy five star reviews. So of course, my first question was, how can I make this meatless? Rewind to my first (and only?) piccata experience: Cheesecake Factory. I fell in love. I am an addict for all things briny and acidic, with white wine, olives, and citrus among my favorite ingredients. It is an actual crisis if there is not at least six each lemons, limes, and some other seasonal citrus (currently grapefruit) in my fridge fruit drawer. On a fluke, sitting at Cheesecake Factory in Edina, Minnesota, years ago, I thought chicken piccata, of which I had no prior knowledge, sounded interesting, and oh, it was. Who knows what the quality of that version was, but you can be sure it packed the butter and capers, and it left a craving for more on my tongue. 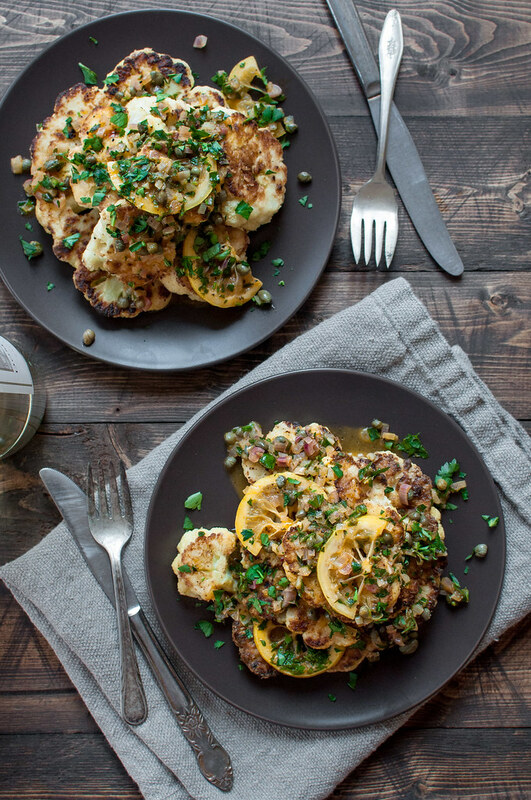 As with many meat dishes, the things I love about piccata have nothing to do with meat. The meat is simply a vehicle, easily replaced with a fibrous, filling vegetable that can be treated almost exactly the same. Oh wait, you don’t have to whip out the plastic wrap and pound the bejeesus out of your cauliflower, or carefully disinfect your cooking tools, so not exactly the same. In any case, easier. And safer. The cauliflower is a bit more voluminous than four chicken cutlets, so the only tradeoff is an extra batch or two of pan frying before you get going on that luscious sauce. 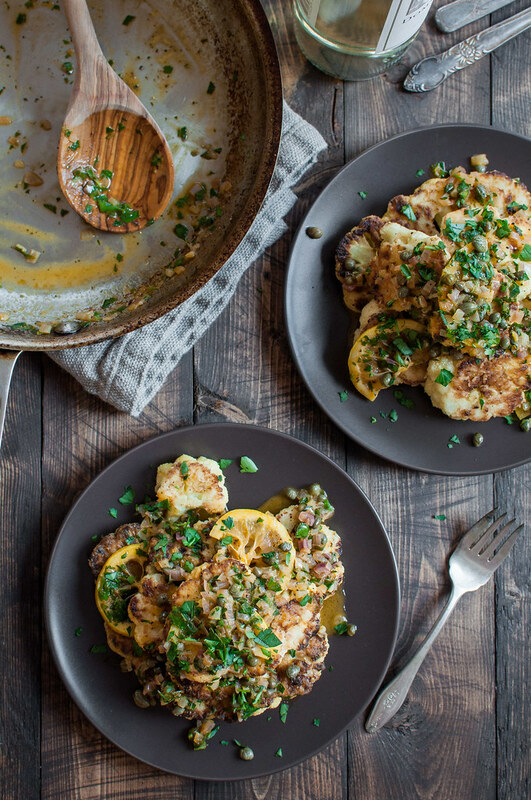 Giada’s recipe, delicious as it sounds, was really just a launchpad into the world of how I would go about drizzling crisp, golden cauliflower steaks with a perfectly balanced piccata sauce. I learned that wine was actually not essential to the preparation, but c’mon, when given the chance to cook with wine (aka drink the rest of the bottle), why would I not? I like the extra bump of acidity I got when replacing half the stock with wine in my final version of cauliflower piccata, but if you don’t happen to have a bottle of dry white on hand or you like to keep your food sober, this recipe will come out two thumbs up if you replace the wine with veg stock. It’s difficult not to notice that new year’s is coming up. We’re about to be bombarded on Pinterest with detox-this and skinny-that, but you’ll find me staying my path of balance, albeit with a few more spinach or chard leaves thrown in, and maybe a little less cheese. 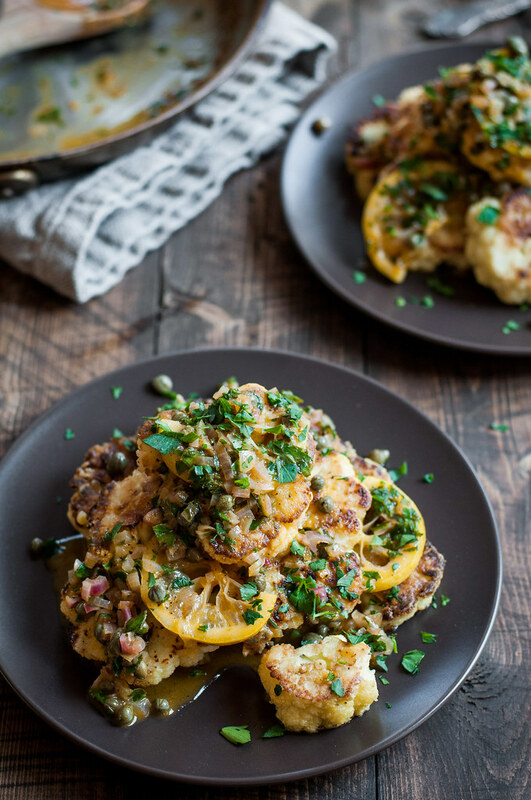 If the new year finds you craving healthier fare, or experimenting with more than just meatless Monday, cauliflower piccata might be just what you seek for dinner. It’s really quick enough for any old weeknight, but it’s impressive enough for date night at home and wooing that special vegetarian someone in your life. Hey, if you must go omnivorous, why not split the recipe half and half? Do your meat thing, then do the cauliflower thing for him/her, and see if you’re not tempted to pluck all the cauliflower off of your sweetheart’s (or child’s) plate. Life update P.S. – I’m currently sitting at LaGuardia airport, seven minutes from departing my comfortable, free wi-fi seat to head for the gate. That plane will take us to Dallas, where Steve works for a few days and I hang out endlessly at Whole Foods and order room service oats and try to find Christmas wrapping within walking radius of our hotel. We then board a plane bound for OKC, where the real fun starts. Christmas with the Hambright family (my sister), including all the folks and fam from Oklahoma, Minnesota, New York, and us! There will be Star Wars, Chick-Fil-A, a baby, cows, and…wine. Duh. Check my Twitter feed for jealous rants about my sister’s just-back-from-Jamaica tan and documentation of Christmas Eve dinner out! A note on the recipe yield: I’ve tested both the full version shown here, and the halved version of the recipe, perfect for two. Both worked great. However, even if you’re working with a single head of cauliflower, you should still make the full sauce recipe. Extra sauce is perfect on pasta or even as a warm dressing for spinach salad. 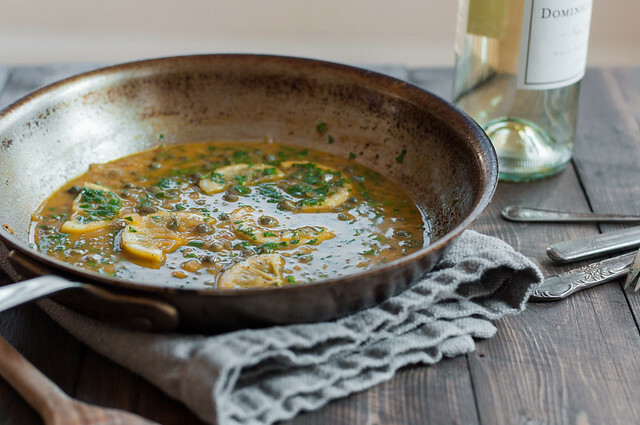 Everyone loves a good, tangy piccata sauce with that smooth, buttery finish. 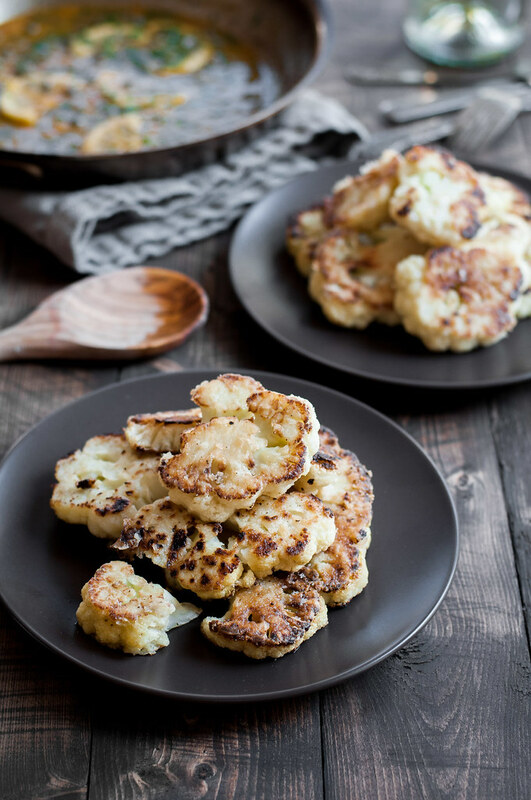 Golden fried cauliflower "steaks" are the perfect stand-in for meat when you want to keep it vegetarian or add extra fiber, and it cooks just as quickly as chicken. See the end notes for an easy gluten free option. Preheat the oven to 275 (F). Set each cauliflower on its core as a base and cut it in half. Continue cutting ½" slices in the same direction. Hold the slabs together as best you can, and gather the smaller chunks that fall off (see photos). Place slabs and pieces on a wire rack placed over a rimmed baking sheet. Spray all over with olive oil spray, then gently turn over and spray the other side. On a dinner plate, mix flour plus a pinch of salt and pepper and dredge each cauliflower piece in it, tapping off the excess flour and returning to the wire rack. Heat a large (12") skillet with 3 tablespoons olive oil over medium high. Add a third of the cauliflower (or as much as will fit in a single layer) and cook about 2½ minutes on each side, until deep golden brown. Return to the wire rack and sprinkle with salt and pepper. Repeat with remaining cauliflower in two more batches, adding a tablespoon of oil to the skillet after each batch. 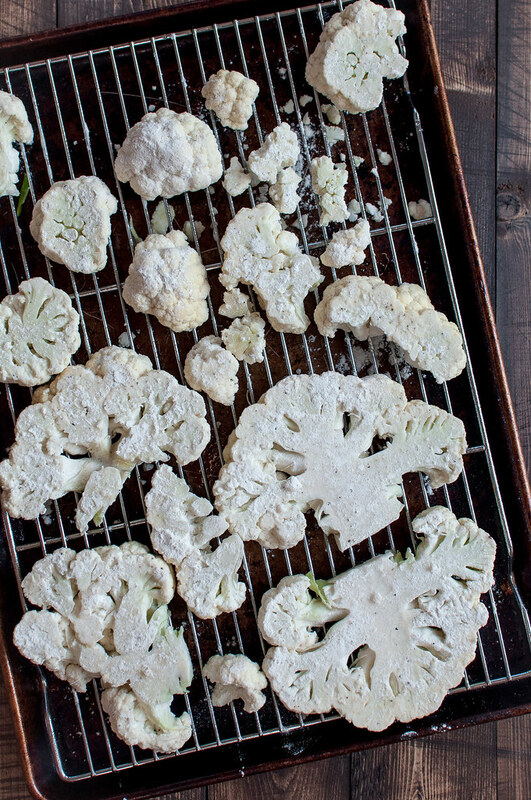 If cauliflower begins browning too quickly, reduce heat slightly. Place pan of cauliflower in the preheated oven while you make the sauce. Add a tablespoon each of oil and butter to the skillet, and heat over medium until butter melts. Add shallots and cook for a few minutes, until softened. Add lemon slices, stock, and wine to the pan. 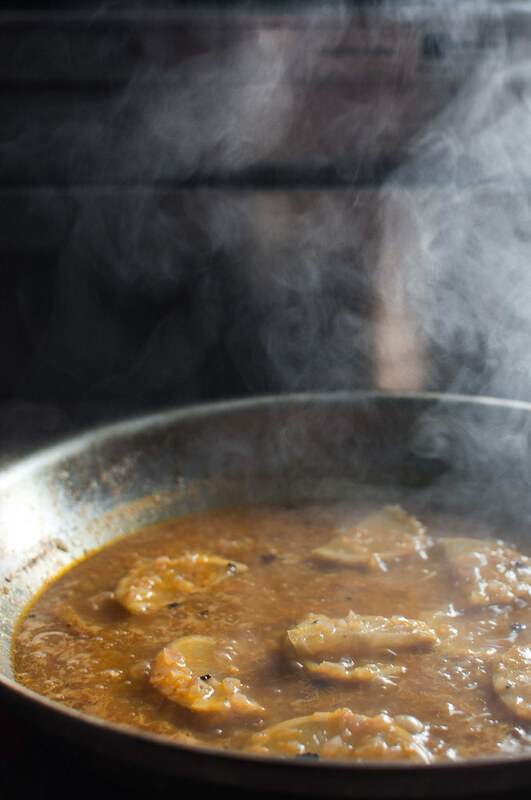 Increase heat to bring to a simmer, then cook about 5 minutes, until slightly reduced. Add lemon juice and capers to pan and simmer another minute. Remove from heat and whisk in remaining 3 tablespoons butter, cut into chunks. Season with salt (not much is needed, since the capers are salty) and plenty of pepper, then stir in 3 tablespoons parsley. Arrange a fourth of the cauliflower on each plate (or all of it on a big platter) and distribute lemon slices evenly over all. Spoon sauce over each plate, and garnish with remaining parsley. If you don't have a wire rack to put over the baking sheet, it's fine, your cauliflower just won't stay quite as crispy after searing. 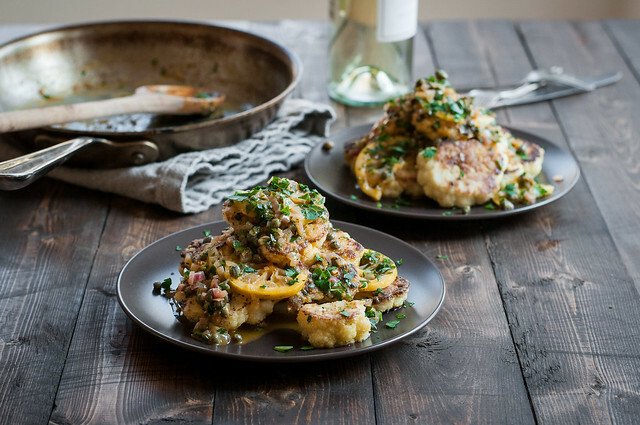 I like the light flour dredge on the cauliflower steaks in this recipe, as it holds up well to the sauce both in texture and flavor. However, to make it gluten free (and save time), you could sear the cauliflower steaks in oil without the flour dredge. Recipe adapted from America's Test Kitchen. Note: This page contains affiliate links. It does NOT contain sponsored content. Affiliate links (to products I recommend, on Amazon) offset my ingredient and website maintenance costs, so I can keep bringing you classic recipes like this one. Thanks! This looks incredible, Tessa! And I totally agree about meat dishes. Nine times out of ten, the meat is just a vehicle. Love that this is made with cauliflower! P.S. Just tried to comment on your goat cheese stuffed bell peppers–they look amazing! But no matter what I changed, I kept getting an error that my comment appeared to be spam. Wanted to let you know in case you’re running any filters you’re unaware of. Pinning that one regardless! Can’t wait to make this! How great that you were featured on foodgawker! Thanks Ruthy–let me know how you like it! I recently stopped eating meat so I’m excited to try this out. Can I just double up the wine and eliminate the Vegetable stock? I like how you think! However, having a mix of wine and stock here keeps the sauce from being either too boozy or too acidic. If you don’t have veg stock around water should work, but you won’t get the rich color of sauce that you see in the photos. And awesome on the meatless switch! When do you bake it?